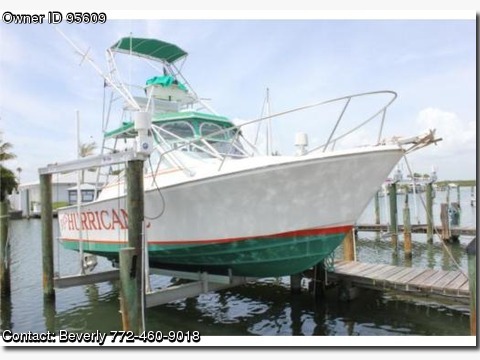 Contact the owner Beverly @ 772-460-9018 or beverlysfor(at)aol(dot)com. (LOCATION: Fort Pierce FL) The Black Watch 26 Express is a hard-charging deep-V fisherman with solid construction, stellar performance, and comfortable ride. She features large cockpit, enclosed helm, marlin tower, updated electronics and roomy cabin. Re-powered in 2008 and re-wired in 2010, she is ready for years of continued service. We start with a 102 square foot cockpit with enclosed helm and marlin tower overhead. The tower is equipped with upper station with full controls and top for shade.